This autumn, Tudor and Elizabethan National Trust properties open their doors for the premiere of Olivier-Award winning OperaUpClose’s new English version of Donizetti’s Maria Stuarda. 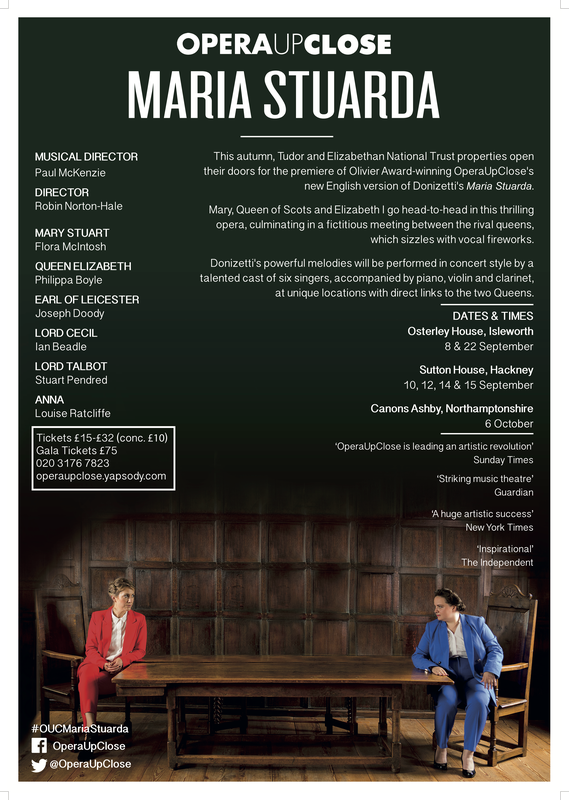 For one night only, Maria Stuarda will be performed overlooking the picturesque gardens, park and farmland, on the impressive stone Portico of Osterley House. A stunning location for Donizetti’s powerful melodies, tapping into the Tudor history of the original manor house built on the site in the 1560s. It is known that Queen Elizabeth I visited the estate when it was owned by her financial adviser, Sir Thomas Gresham, and the original buildings still remain today. Tickets cost £23 (£15 Concessions available, please call 020 3176 7823). You can pre-book a parking spot in Osterley’s car park for £5.50, parking will cost £7 on the day and is subject to availability. The car park is 400 yards up the main driveway from the house. Alternatively you can take the Piccadilly Line to Osterley station, which is 1 mile from the house.